Beautiful 19th Century genuine Old West Buffalo Coat. By 1880 nearly all the Northern American Buffalo were extinct. Buffalo coats were necessary for the northern cold weather in the USA. This is one of those coats. I have other Buffalo, Bear and Raccoon, and Beaver coats. 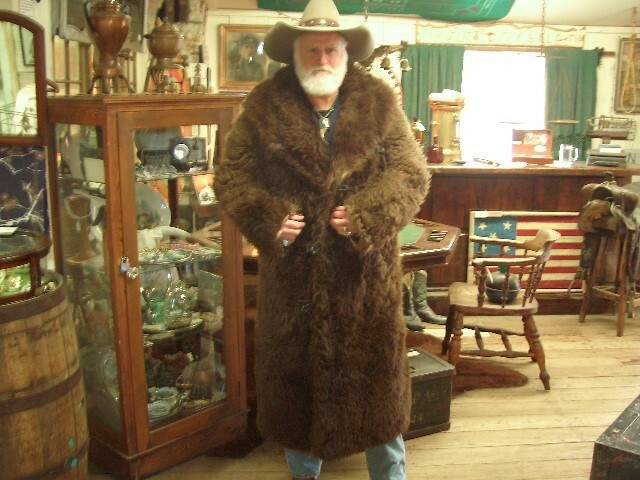 Beautiful 19th Century genuine Old West Buffalo Coat. By 1880 nearly all the Northern American Buffalo were extinct. Buffalo coats were necessary for the northern cold weather in the USA. This is one of those coats. I have other Buffalo, Bear and Raccoon, and Beaver coats. Please email cowboyron@cowboycabin.com with questions or call 406 270-2842.